This study analyzes the long-term transformation of growth regime and the process of de-industrialization in Japan, taking account of domestic institutional changes and international economic relations. Influenced by the structural changes in the manufacturing industry and the long-lasting recession, de-industrialization has accelerated in the Japanese economy since the 1990s. In particular, linkages between the export-goods manufacturing industry and the business-related service industry are analyzed to understand the characteristics of de-industrialization. In this study, we have attempted to extend the theoretical framework of the growth regime in the régulation theory, taking account of long-term industrial structural changes. Both the macroeconomic analysis of growth and distribution and Input-Output Analysis are conducted on the basis of institutional analysis. This study employs the régulationist perspective to consider the possibility of a new growth regime in Japan. Notre étude a pour objectif d’analyser la transformation du régime de croissance à long terme et le processus de la désindustrialisation au Japon, en prenant en compte les changements institutionnels domestiques et les relations économiques internationales. Influencée par un changement structurel dans l’industrie manufacturière, la désindustrialisation s’est accélérée dans l’économie japonaise depuis les années 1990. En particulier, les liens entre l’industrie manufacturière des biens d’export et l’industrie des services liés au business sont analysés pour comprendre les caractéristiques de la désindustrialisation. Dans notre étude, nous avons tenté d’étendre le cadre théorique du régime de croissance dans la perspective de la théorie de la régulation en prenant en compte les changements structurels industriels à long terme. Notre analyse macroéconomique de la croissance et de la distribution et celle en termes d’entrées-sorties sont toutes deux conduites à partir de l’analyse institutionnelle. Cette étude emploie une perspective régulationniste pour considérer la possibilité d’un nouveau régime de croissance au Japon. Nuestro estudio tiene por objetivo analizar las transformacines del régimen de crecimiento a largo plazo y el proceso de desindustrialización de Japón, tomando en cuenta los cambios institucionales domésticos y las relaciones económicas internacionales. Influenciadsos por un cambio estrucural en la industria manufacturera, la desindustrialiazación se ha acelerado en la economía japonesa despues de los años 1990. En particular, las relacionmes entre la industria manufacturera de los bienes de exportación y la inudustria de los servicios relacionadas a los negocios son analizados para comprender las características de la desindustrialización. En nuestro estudio nosotros hemos tratdo de extender el marco teórico del régimen de crecimiento en la perspectiva de la teoría de la regulación tomando en cuenta los cambios estructurales de la industria a largo plazo. Nuestro análisis macroeconómico del crecimiento y de la distribución y de los términos de insumo producto son ambos conducidos a partir del análisis institucional. Este estudio emplea una perspectiva regulacionista para considerar la posibilidad de un nuevo régimen de crecimiento de Japón. 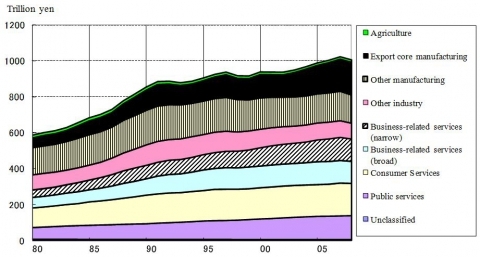 1In the Japanese economy, de-industrialization has accelerated since the long-lasting recession in the 1990s. 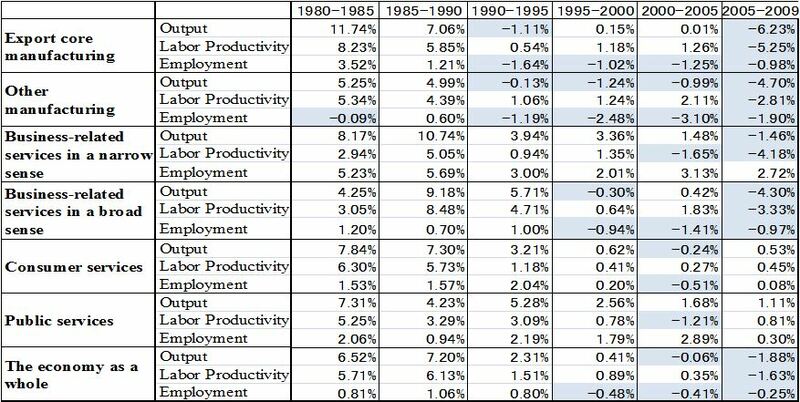 De-industrialization is usually defined as the relative decline in output and employment, which is universally observed in the advanced economies. In Japan’s case, however, de-industrialization has accelerated very rapidly, triggered by institutional changes in the domestic economy and changes in international economic relations. The Japanese economy, which witnessed the stable export-led growth in the 1980s, has experienced a long period of stagnation and rapid industrial structural changes, especially, de-industrialization since the 1990s. In this situation, the creation of new industrial structures and establishing a stable growth regime are essential. 1 For the precise information on JIP database, see Fukao and Miyagawa (eds.) (2008). 3We focus on three specific points for our analysis. First, we analyze the process of long-term economic development in Japan, especially focusing on changes in institutional forms and the transformations of growth regime from the perspective of régulation theory (Boyer, 1988; Petit, 1988, 2005).2 Second, we thoroughly analyze structural economic dynamics, focusing on specific structural characteristics of the Japanese industries: the export-goods manufacturing industry, the non-export-goods manufacturing industry, the business-related services industry, and the consumer services industry, etc. Third, we analyze structural linkages between the manufacturing industry and the service industry to understand the characteristics of de-industrialization in the Japanese economy. To this end, we extend the method of analyzing de-industrialization based on Input-Output Analysis which was developed by Franke and Kalmbach (2005) in the context of the German economy. Furthermore, we consider conditions essential for establishing a new growth regime in Japan. 4In the process of economic growth, the dynamics of demand factors and supply factors play an important role, and the interaction of real and financial factors influences the dynamics of the economy. Furthermore, industrial structural changes should be integrated in the analysis of economic growth, especially when we consider the process of de-industrialization. 5First, we will consider the long-term interaction between demand and supply factors in the economy. According to the régulation theory, a growth regime is said to be established when a national economy achieves stable economic growth. The cumulative effect of productivity and output growth determines the dynamism of a growth regime. This effect operates more strongly in the manufacturing industry (Kaldor, 1978; Petit, 1986; Boyer, 1988).3 The basic framework of cumulative growth and de-industrialization is depicted in Figure 1. 6The main logic of demand formation is as follows: productivity gains are distributed as wages and profits, and an increase in profits has a positive effect on the expected profit rate and investment within a given monetary/credit regime.4 An increase in investment further realizes more profits. Therefore, there is a mutually reinforcing causality between the profit rate and the accumulation rate (Marglin, 1984). Furthermore, investment leads to an increase in intermediate inputs from the other manufacturing sectors and the service sectors. At the same time, an increase in wages, which is mediated by institutional coordinating mechanisms in the wage-labor nexus, leads to more consumption demand. As a result, consumer durables market and consumer services expand. 7Next, there is a linkage effect from consumption to investment, comprising both short-period and long-period effects. In the short-period, changes in demand in the manufacturing industry influence investment through the adjustment of capacity utilization. This is referred to as “the principle of capital stock adjustment.” Regarding the long-period effect, a continuous expansion of consumption influences the expected return on investment, leading to continuous increase in investment. This is called “the accelerator effect.” In the actual process of investment decision-making, these effects and the influence of profit rate are integrated. 9The linkage from demand growth to productivity growth is another major causal chain in the economy. An increase in investment leads to an increase in productivity, replacing capital equipments. This effect is more remarkable in the manufacturing industry with the dynamics of the introduction of new capital equipments and the scrapping of old ones. Furthermore, an increase in production also leads to productivity growth through increasing returns to scale especially in the manufacturing industry. This causality characterizes what is called the “Kaldor-Verdoon Law.” Innovation also contributes to productivity growth depending on the social system of innovation (Amable, Barré and Boyer, 1997) in each national and regional economy. 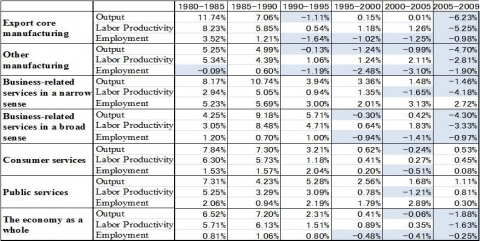 These linkages from demand growth to productivity growth are called “the productivity regime” (Boyer, 1988). The dynamic interaction between “demand regime” and “productivity regime” produces the “cumulative causation” of a growth regime, mediated by a flux of dynamic coordinating mechanisms, called a “mode of régulation”. 10Moreover, the following points are pertinent in connection with linkages between the manufacturing industry and the service industry, which should be particularly focused on in the study of de-industrialization (Petit, 1986, 1988). First, the cumulative causation between output growth and productivity growth operates strongly in the manufacturing industry. On the contrary, the cumulative causation is relatively weak in the service industry. Therefore, if the service industry expands as a result of long-term shift in demand from the manufacturing to the service industry, the cumulative causation may become weaker for the economy as a whole. Second, the manufacturing industry has its own structural changes, called “subsystem dynamics” (Landesmann and Scazzieri, 1996) and causes changes in the linkage between the manufacturing industry and the business-related service industry with the externalization of business activities and changing intermediate inputs. The spillover effect of intermediate demand between the manufacturing industry and the service industry contributes to output and productivity growth in both industries. For example, business-related services promote productivity growth in the manufacturing industry, and the input of business equipments fosters productivity in the service industry. 11The dynamism of a growth regime determines the trend and fluctuations in output, labor productivity, and employment in both manufacturing and service industries, thus determining the pattern of de-industrialization. Moreover, output growth and labor productivity growth particularly determine employment growth. We can formalize this relationship as follows: (the growth rate of real output) – (the growth rate of labor productivity) = (the growth rate of employment). Based on this equation, we can define de-industrialization in terms of employment. Mature economies tend to have a smaller percentage of their workforce employed in the agricultural sector. In such economies, de-industrialization occurs in terms of the relative share of employment when the growth rate of real output minus the growth rate of labor productivity in the service industry is larger than that in the manufacturing industry. This set of dynamics was originally formalized by Baumol (1967) and applied to the process of de-industrialization in the Rowthorn’s model (Rowthorn and Wells, 1987; Rowthron and Ramaswamy, 1999). Moreover, Rowthorn and Wells classified de-industrialization into two types: “positive de-industrialization” and “negative de-industrialization.” While the former is caused by productivity growth differentials between the manufacturing industry and the service industry, the latter is caused by stagnant output in the manufacturing industry. This classification clearly describes the differing nature of the two different types of de-industrialization. However, while studying the dynamics in industries of a more detailed category, we should take into account increasing intermediate inputs from the business-related service industry to the manufacturing industry (Franke and Kalmbach, 2005). We should also consider long-term shifts in demand in particular service industries. These different mechanisms of de-industrialization will be explored in detail in Section 5. 12Furthermore, foreign trade and foreign direct investment (FDI), which determine a country’s insertion into the global economy, have the following effects in the growth process. Trade specialization in goods and services impacts the dynamism of the national economy. For example, the export goods manufacturing industry can be a starting point of “cumulative causation,” producing tradable products with increasing returns to scale. Heavy dependence of the national economy on the export of natural resources may exacerbate long-term economic stagnation. In this manner, a pattern of trade specialization has the potential to generate either a “virtuous circle” or a “vicious circle” in a growth process in the national economy. FDI sometimes produces concurrent positive effect with international division of labor, and negative effect causing the acceleration of de-industrialization, or the hollowing-out of industry in the worst-case scenario. 13Patterns of long-term growth in the Japanese economy are seen in the interaction between the rate of capital accumulation and the profit rate, as depicted in Figure 2. Sources: Cabinet Office, Annual Report on National Account and Gross Capital Stock of Private Enterprises. 14In the Japanese economy in the 1960s, the accumulation rate and the profit rate had a strong mutually enhancing effect, producing profit-investment-led growth in the period of high economic growth. The high economic growth phase ended with the saturation of the domestic demand of consumer durable goods and continuously rising wages in the 1970s. The Japanese economy was hit by the oil-price shock in 1973 and experienced a structural recession in the 1970s. Unlike other advanced economies, the Japanese economy started recovering from the recession very early and experienced export-led growth in the late 1970s. Substantial export demand led to a relatively stable accumulation rate and profit rate in the 1980s. However, the accumulation rate registered continuous rise, while the profit rate started to fall even in the bubble boom of the late 1980s.6 This was a kind of “over-accumulation”, so the Japanese fell into the structural crisis due to the over-accumulation and the collapse of bubble boom in 1991. The accumulation rate and the profit rate sharply decreased in the process. After the so-called “ Lost Decade,” the Japanese economy started recovering from the recession in 2002, marked by a slight recovery in the profit rate, but almost no recovery in the accumulation rate at the aggregate level. This process of recovery was prompted by the export goods industry, which was strongly dependent on exports to Asian countries. The profit rate substantially registered a sharp fall when the Japanese economy was hit by the subprime crisis and a decrease in exports in 2008. Source: Cabinet Office, Annual Report on National Account. 15Fluctuations in the profit rate are determined by examining wage share and output-capital ratio.7 The relationship between the real GDP growth rate and wage share is depicted in Figure 3. In the Japanese economy, counter-cyclical fluctuation in wage share is observed because of “labor hoarding” in large firms in the manufacturing industry, supporting consumption demand in a recession.8 However, in the recovery process after 2002, there was a sharp fall in wage share because wages were depressed and many workers lost their job owing to institutional changes in the employment system. The wage share started to rise again when the Japanese economy was hit by the subprime crisis in 2008, and this created a strong pressure to reduce employment. 16It is imperative to take into account industrial structural changes in order to understand the long-term dynamics inherent in the Japanese economy. The export goods manufacturing industry plays a central role in Japan’s economic growth. Moreover, structural changes in the manufacturing industry and inter-linkages between the manufacturing and the service industry strongly influence growth patterns in Japan. Therefore, we should employ an appropriate classification system for Japanese industries to analyze its economic structures. For this purpose, we modified the industry classification system used by Frank and Kalmbach (2003, 2005) to analyze de-industrialization in Germany. We also utilize the Japan Industrial Productivity (JIP) Database for our analysis. Note: Outputs are measured at 1995 constant prices. Source: Research Institute of Economy, Trade and Industry (RIETI), JIP Database. 17The following points should be noted with respect to the industry classification presented in Table 1. First, the manufacturing industry is classified into “the export core manufacturing” industry with a high export ratio and “the other manufacturing” industry, emphasizing the leading role of “export core manufacturing” in promoting economic development.9 The “other industry” includes construction and mining. The service industry is classified as “business-related services in a narrow sense”, “business-related services in a broad sense,” “consumer services,” and “public services,” thus emphasizing their structural linkages with the manufacturing industry. Figure 4 shows long-term changes in industry structures in terms of real output on applying this classification system to the Japanese economy. 18As we can observe from the growth rate of each integrated industry depicted in Figure 5, “the export core manufacturing” industry has shown the strongest response to fluctuations in external demand. This has influenced the other industries. Moreover, “the business-related services” industry has fluctuated almost in line with “the export core manufacturing” industry. In the Japanese economy, each industry has a different pattern of trend and fluctuation in “the demand regime.” Especially, “the export core manufacturing” industry played a leading role in influencing other industries and in causing the disproportionate export-led growth of the late 1990s and early 2000s. 19Industry-wise accumulation rates can be seen in Figure 6. The accumulation rate increased sharply in “the export core manufacturing” industry during the bubble boom of the late 1980s. This was the main force behind the “over accumulation” and subsequent excess capacity seen in Figure 2. Furthermore, capital accumulation also increased in “the business-related services” industry, induced by the dynamics of “the export core manufacturing” industry, in the late 1980s and early 2000s. 20The growth rates of industry-wise labor productivity in “the productivity regime” are seen in Figure 7. The “export core manufacturing” industry shows high growth of labor productivity with large fluctuations, while labor productivity in the “other manufacturing” industry remains at a relatively low level. Innovation and increasing returns to scale have worked effectively in “the export core manufacturing” industry. On the contrary, the growth rate of labor productivity in the service industry is low in general, but the “business-related services” industry in both narrow and broad sense shows relatively higher growth rates. In general, the productivity growth differentials between “the export core manufacturing” industry and the other industries comprise the remarkable structural characteristics relating to disproportionate export-led growth in the Japanese economy. 21Since the 1990s, the Japanese economy has experienced stagnant growth and a transformation of the growth regime. These were caused by institutional changes in both the financial system and wage-labor nexus without the re-establishment of the mode of régulation. In this situation, de-industrialization has accelerated with institutional changes and changing international economic relations with the other Asian countries. 22Major institutional changes occurred in the Japanese economy in the period from the 1990s to early 2000s which is called “Lost Decade”. The financial and employment systems changed very rapidly, influenced by excess capital stock, excess non-performing loans, and excess employment. 23The excess capital stocks, resulting from over accumulation in the late 1980s, heavily pressured the production systems, firm organization, and inter firm relations in the manufacturing industry, prompting them to transform gradually in the 1990s. Japanese firms pursued scrapping of capital stocks, closing of factories, rationalization of firm organization and reorganization of subcontracting networks. In this situation, various business activities across manufacturing firms were externalized as business-related services with a productivity increase in the manufacturing industry. This influenced the pattern of de-industrialization in Japan. 24Furthermore, in the Japanese financial system, non-performing loans caused the balance sheet problem of Japanese firms in the prolonged recession, and it was exacerbated more in the severe financial crisis caused by the “Japanese Big Bang” in 1998.10 This led to a contraction in credit creation with stagnant capital accumulation even with expansionary monetary policies. In this situation, the main bank system and cross shareholding weakened, and financial services expanded in the more liberalized financial market. 25Excess employment accumulated in Japan during the prolonged recession in the 1990s. As depicted in Figure 3, labor hoarding in large firms led to an increase in wage share during this period. In this situation, Japanese firms increased the number of non-regular workers to reduce overall wage costs. Furthermore, job security was weakened and even regular workers were released from the manufacturing industry in the early 2000s. This occurred not only in the non-export goods manufacturing industry, which witnessed stagnant productivity growth, but also in “the export core manufacturing” industry. This was reflected by a sharp increase in labor productivity in the electrical machinery industry, and in general, “the export core manufacturing” industry, as depicted in Figure 7. In this way, the wage-labor nexus gradually changed, effecting changes in the growth regime, in the 1990s. 26Furthermore, the spring offensive (Shunto), the Japanese traditional wage negotiation system, collapsed with the weakening of trade unions, subsequently depressing wages across all industries in the late 1990s and the early 2000s. These institutional changes led to a sharp fall in wage share (Figure 3) and stagnant consumption demand. With stagnant investment and consumption, the Japanese growth regime was gradually transformed, losing its dynamism, in the long-lasting recession during the 1990s. 27Japanese firms’ FDI in Asia has sharply increased since the 1990s. Especially, Japanese firms in “the export core manufacturing” industry have actively extended their production networks in East Asia, and subsequently, intermediate-goods trade has rapidly increased in this region. With fierce international competition, Japanese multinational firms, that were previously concerned with domestic economic issues, created their own strategies for extending their business activities across the Asian region, relatively independent of Japan’s domestic interests. Source: Ministry of Economy, Trade and Industry (METI), Survey of Overseas Business Activities. 28Figure 8 shows the ratio of overseas production in Japanese manufacturing firms. The ratio of overseas production of the Japanese manufacturing industry, especially the transportation equipment industry, was very high in the 2000s.11 The increase in overseas production in East Asia created “induced exports” of intermediate goods from Japan to Asian countries (Wang, Shrestha and Uemura, 2012), making a positive impact on domestic employment in “the export core manufacturing” industry. The ratio of overseas production has not decreased much after the subprime crisis in 2008. In 2010, the ratio was 18.1% for the manufacturing industry as a whole and 39.2% for the transportation machinery industry. However, when the Japanese economy was hit by the subprime crisis in 2008 and the great earthquake in 2011, the increase in overseas production and procurement accelerated de-industrialization with a negative effect on domestic employment in Japan. 29In the long-lasting recession of the 1990s, Japan’s growth regime was transformed, as result of excess capital stock, financial crisis, weakening job security, and the expansion of international production networks. In this situation, production activities were reorganized in Japanese firms, leading to changes in intermediate input structures. In particular, the externalization of business activities of the manufacturing industry to the “business-related services” industry accelerated as a form of business-process outsourcing and leasing, which influenced the input structures of the manufacturing industry. This impacted de-industrialization mechanism, especially in the Japanese case. 30In the theoretical framework of de-industrialization laid out in Rowthorn and Wells (1987), which is introduced in Section 2, two types of de-industrialization are explained. The one type is “positive de-industrialization,” which is caused by productivity growth differentials between the manufacturing industry and the service industry. In this case, higher productivity growth in the manufacturing industry prompts a shift in employment from the manufacturing to the service industry. The other type is “negative de-industrialization,” which is caused by stagnant output in the manufacturing industry during recession. In this case, employment shifts from the manufacturing to the service industry with increasing unemployment. 32In order to investigate “de-industrialization by manufacturing-service linkages,” we examine the factors that cause structural changes in the intermediate inputs into the manufacturing industry. Franke and Kalmbach (2003, 2005) developed an analytical framework to study de-industrialization in Germany, taking into account intermediate inputs in the Input-Output Analysis. We follow their methodology to study changes in input structures in the Japanese manufacturing industry from 1980 to 2008 by using data drawn from the JIP Database 2011. We investigate changes in the input matrix, which shows the volume of intermediate goods put into an industry to produce a single unit of product. In particular, we focus on the intermediate input of services to the manufacturing industry for producing one unit of product. 33Franke and Kalmbach (2003, 2005) distinguish between “input coefficient matrix” and “technology matrix” in their Input-Output Analysis. The input coefficient matrix is decomposed into two matrices, as follows. 34where matrix A is an input coefficient matrix, and matrix AT is a technology matrix whose entry aTij indicates the quantity of good i that is technologically required per unit of output j. Matrix H is a matrix that indicates the domestic share of intermediate inputs whose entry hij is the share of its intermediate inputs of good i that sector j purchases in the home country. 35In our analysis, input coefficients are divided into technical coefficients and domestic input coefficients, and we focus solely on changes in technical coefficients across the period of the study. 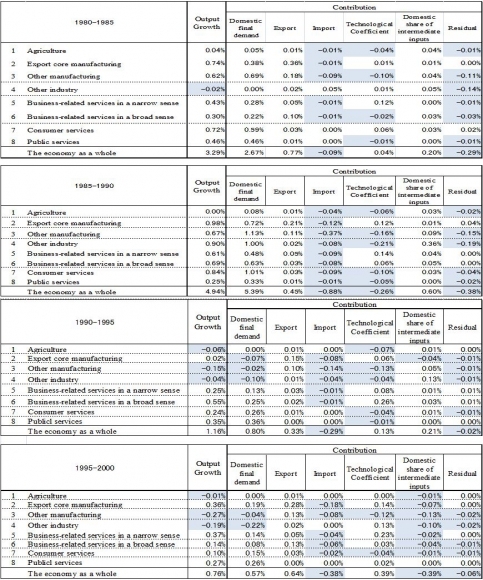 In this framework, we estimate only the effect of change in technical coefficient of the manufacturing industry, namely, “the export core manufacturing” industry and “the other manufacturing” industry on the output of other industries, keeping the input structures unchanged in other industries. This analysis reveals the effect of structural changes in either of the manufacturing industries on other industries, including any spillover effects through input-output relations. 36We point to some important characteristics of structural changes in the manufacturing industry in Table 3 and Table 4. Table 3 shows change in output in each industry induced by only a change in technical coefficients in “the export core manufacturing” industry. An increase in intermediate input in “the export core manufacturing” industry has a positive effect on its own output and has a negative effect on the output of “the other manufacturing” industry. In other words, interdependence within “the export core manufacturing” industry has strengthened which implies that “the export core manufacturing” industry has its own “subsystem dynamics” (Landesmann and Scazzieri, 1996). Furthermore, an increase in the intermediate input in “the export core manufacturing” industry leads to an increase in output of “the business-related service industry in a narrow sense.” In short, structural changes that occurred after the 1990s in “the export core manufacturing” industry have led to an increase in its own output and that of the business-related service industry, while decreasing output of “the other manufacturing” industry. 37We can see the effect of a change in technical coefficients in “the other manufacturing” industry on each industry in Table 4. Whereas the change has induced an increase in output of “the export core manufacturing industry” and “the business-related service industry in a narrow sense,” it has not caused an increase in its own output. In other words, “the other manufacturing” industry does not have strong intra-industrial linkages. 38In short, “the export core manufacturing” industry plays a leading role in the Japanese economy, inducing an increase in output of “the business-related service industry in a narrow sense” as a backward linkage effect. This effect has become stronger in recent years. De-industrialization has been brought about not only by changes in output and productivity growth, but also by structural changes in intermediate inputs into “the export core manufacturing” industry. The share of “the export core manufacturing” industry and “business-related services” industry has increased with the strong indirect effect of demand creation in both industries since the 1990s. Moreover, these industries have higher productivity growth, and as a result, these leading industries influence other industries in the Japanese economy. 39To investigate the process of de-industrialization with the transformation of the growth regime, we decompose the output changes into domestic final demand, export, import, technical coefficient, and the domestic share of intermediate inputs. 40By using the Leontief inverse matrix B = (I – A)–1, we can decompose a change in real output vector into change in domestic final demand, export, import, technical coefficient and domestic share of intermediate inputs. The theoretical formula is as follows. 43where vector y is final demand, vector ydfd is domestic final demand, vector yex is export, and vector yfim is import as final demand. 44Results of this analysis are summarized for different time periods in Table 5: stable growth in the 1980s (1980-1985, 1985-1990), long-term recession in the 1990s (1990-1995. 1995-2000), recovery in the first half of the 2000s (2000-2005), and recession with the financial crisis of the late 2000s (2005-2009). The mechanism of de-industrialization in terms of real output changed in each period with the transformations of the growth regime. 45In the period of 1980-1985, export contribution to growth was significant. However, with decelerating exports caused by the appreciation of yen following the Plaza Accord, domestic demand eventually emerged as a major contributor of growth in the bubble boom period of 1985-1990. Sufficient export and domestic demand had a countervailing effect on the de-industrialization process in Japan. Although there were fears relating to the hollowing-out of industry with the de-localization of productive activities in Japan in the late 1980s, the absolute level of manufacturing employment was sustained with a slightly decreased relative share due to an increase in service employment (see Figure 9). In this period, the character of de-industrialization in terms of employment was not influenced so much by a shift of employment from the manufacturing to the service industry, but by an increase in output of the service industry due to the expansion of domestic demand. This corresponds to “de-industrialization by long-term shifts in demand from the manufacturing to the services”. 46At the beginning of the 1990s, the Japanese economy experienced a deep recession due to over accumulation and the collapse of the bubble boom, resulting in a sharp decrease in domestic demand. In this situation, “the export core manufacturing” industry led economic growth and had contributed to the increase in total output. In the 1990-95 and 1995-2000 period, de-industrialization mechanism reflected a different character than before. In “the export core manufacturing” industry, both output and labor productivity increased, and as a result, the “positive de-industrialization” mechanism operated in this particular industry. On the contrary, in “the other manufacturing” industry, a decrease in output coexisted with an increase in labor productivity, resulting in the operation of a “negative de-industrialization” mechanism. At the same time, as examined in the previous section, the manufacturing-service linkages strengthened with an increase in output of “the business-related services” industry, resulting in the operation of “de-industrialization by manufacturing-service linkages” mechanism. 47In 2002, following the so-called “Lost Decade,” the Japanese economy started recovering. Our analysis for 2000-05 shows that exports exclusively led the growth of “the export core manufacturing” industry. Domestic demand decreased with stagnant consumption, brought about by falling wage share. In this situation, the growth gap between “the export core manufacturing” industry and “the other manufacturing” industry widened with the further expansion of “business-related services” in the form of “de-industrialization by manufacturing-service linkages,” while “personal services” remained stagnant. The results for 2005-09 reflect effects of the subprime crisis of 2008. “The export core manufacturing” industry, which previously led economic growth, experienced a decrease in output as a result of sharp fall in exports to the US and Asia. This further led to a corresponding decrease in output in “the business-related services” industry. 48In short, a stable export-led growth regime, supported by export as well as domestic demand, existed in the 1980s. In the long-lasting recession, following the collapse of the bubble boom in 1990, the growth regime transformed with gradual institutional changes, and the pattern of de-industrialization in the Japanese economy also changed. 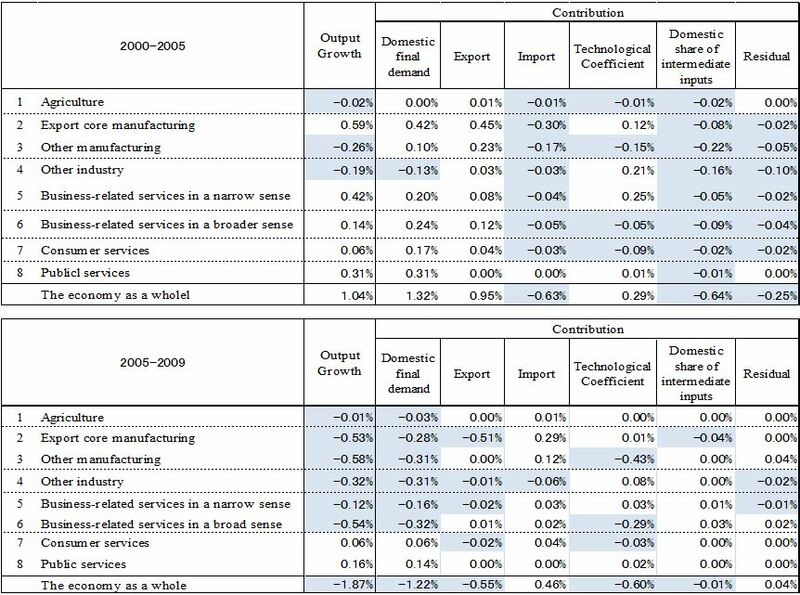 In this situation, “the export core manufacturing” industry and “the business-related services” industry supported economic growth, while “the other manufacturing” industry negatively contributed to economic growth, showing stronger inter-industry disparity and accelerating de-industrialization. 49The transformation of growth regime and the changes in de-industrialization mechanisms influence employment structures in different ways in different periods. 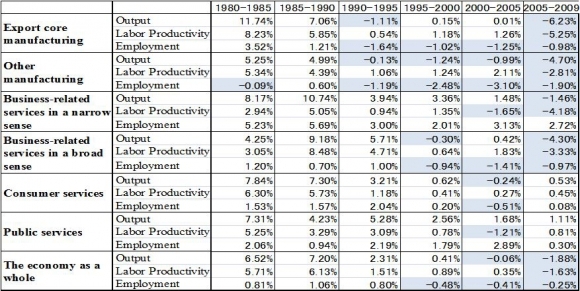 As explained in Section 2, we can investigate shifts in employment, as shown in Figure 9, by analyzing growth rates of output and labor productivity. 50Table 6 shows the annual growth rates of output, labor productivity, and employment in each industry. When the growth rate of output exceeds the growth rate of labor productivity, employment increases in that particular sector. On the contrary, when the growth rate of output is less than the growth rate of labor productivity, employment decreases in that particular sector. Therefore, we can investigate shifts in employment in a sector by examining the growth rates of output and labor productivity. Moreover, these rates of growth are not independent and are rather brought about by “cumulative causation” between output growth and productivity growth in the economy as a whole, as we have seen in Section 2. 51In the 1980s, although there was a growth differential between “the export core manufacturing” industry and “the other manufacturing” industry in the Japanese economy, it witnessed expanding domestic demand with positive growth rates in both industries in the export-led growth regime. Therefore, de-industrialization did not occur explicitly in terms of the level of employment during the period. 52In the long-lasting recession of the 1990s, however, the differential between “the export core manufacturing” industry and “the other manufacturing” industry was maintained at lower growth rates. Subsequently, employment decreased as a result of the mechanism of “positive de-industrialization” operational in “the export core manufacturing” industry. Employment registered a more remarkable decrease as a result of the mechanism of “negative de-industrialization” operational in “the other manufacturing” industry. On the contrary, employment increased in “the business-related service in a narrow sense” as a result of the mechanism of “de-industrialization by manufacturing-service linkages.” Business-process outsourcing accelerated, producing more service employment during this period. Therefore, even in the 2005-2009 period including the global financial crisis, “business-related service in a narrow sense” recorded a growth rate as high as 2.72% and demonstrated a strong relationship with “the export core manufacturing” industry. 53Employees released by the manufacturing industry are absorbed by the service industry. Since the 1990s, employment has continuously increased in the service industry with a decrease in labor productivity in services. In other words, all the service industries except “business-related service in a broad sense” acted as an “employment sponge” and absorbed discharged employees, and showed positive growth rates of employment even during the 2005-2009 period which included the world financial crisis. 54The absorption of employment by the service industry is socially preferable, as it contributes to the retention of employment in the whole economy. However, this caused two serious problems in the Japanese case. From the institutional point of view, workers laid off by manufacturing firms were often re-employed as non-regular workers by smaller firms in “the business-related services” industry. This process was further promoted by the externalization of service activities from manufacturing firms. This process of absorption of employment in the service industry and the increasing number of non-regular workers made Japanese society more unequal. 55From the structural point of view, releasing workers from the manufacturing industry and re-employing them in the service industry had a productivity-enhancing effect on the manufacturing industry and a productivity-suppressing effect on the service industry. Under these conditions, polarization occurred between the high-productivity manufacturing industry and the low-productivity consumer services industry, weakening the coordinating mechanisms of wages and employment. This was a phenomenon specific to economic growth induced by “the export core manufacturing” industry in the 2000s, which was not seen even in the export-led growth during the 1980s. After the subprime crisis in 2008 and the earthquake in 2011, “the export core manufacturing” industry was damaged to such an extent that it exacerbated the polarization of the Japanese economy and society. 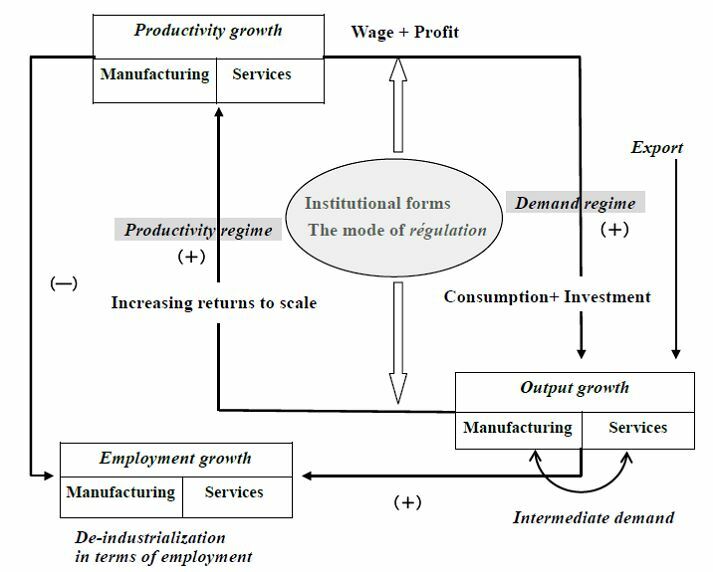 56We analyzed the transformations of growth regime and de-industrialization in Japan after the 1980s within a framework that integrates the growth regime of the régulation theory and the Input-Output Analysis of de-industrialization. 57First, the Japanese economy experienced a transformation of growth regime with financial liberalization and institutional changes in wage-labor nexus during the long-lasting recession of the 1990s. During the post-2002 recovery process, although the profit rate recovered with a sharp decline in wage share caused by depressing wages and firing workers, a new growth regime with a full-fledged régulation mode was not established. The Japanese economy maintained its export-led nature, but the core mechanisms to promote productivity growth and coordinating mechanisms were severely weakened by gradual institutional changes owing to financial liberalization and neo-liberalist labor policies. Furthermore, heavy reliance on exports rendered the Japanese economy stagnant and the accumulation rate remained at very low levels. 58Second, significant differentials in output and productivity growth rates exist between “the export core manufacturing” industry and “the other manufacturing” industry. Furthermore, structural linkages of the “business-related services” industry are much stronger with “the export core manufacturing” industry than the “consumer services” industry. In the 1990s, “the export core manufacturing” industry supported economic growth under the condition of stagnant domestic demand, and this induced the growth of “the business-related services” industry through intermediate demand from “the export core manufacturing” industry. The delocalization of productive activities became very active in “the export core manufacturing” industry, but Japanese firms in this industry did not significantly scale down their output, thus maintaining a positive relationship between FDI and exports until the mid-2000s. However, when the Japanese economy was hit by the subprime crisis in 2008, both export and industrial output fell sharply, causing severe unemployment problems. 59Third, the process of de-industrialization has demonstrated several characteristics in the Japanese economy. In the 1980s, de-industrialization was mitigated by an expansion in export and domestic demand, and only “de-industrialization by long-term shifts in demand from manufacturing to the services” was observed during the bubble boom in the late 1980s. During the long-lasting recession after the collapse of the bubble in 1990, “positive de-industrialization” was operational in “the export core manufacturing” industry in tandem with higher productivity growth, and “negative de-industrialization” occurred in tandem with stagnant demand in “the other manufacturing” industry. Therefore, polarization was exacerbated in terms of output and employment in the Japanese economy. Furthermore, the mechanism of “de-industrialization by manufacturing-service linkages” continued to strengthen after the late 1980s, becoming quite remarkable in the 1990s. As a result, de-industrialization in terms of employment has accelerated since the 1990s in the Japanese economy. 60Fourth, with regard to structural changes within the manufacturing industry, intra-manufacturing linkages have become stronger since the 1990s, especially in “the export core manufacturing” industry. Furthermore, output of “the business-related services” industry increased with the technical coefficient effect and domestic demand effect, and output of “the consumer service industry” also increased with the expansion of final domestic demand. In this situation, workers released by “the export core manufacturing” industry, “the other manufacturing” industry, and “the other industry” were mostly absorbed by the service industry as non-regular workers. After the 2008 subprime crisis, however, output of “the export core manufacturing” industry decreased drastically, and consequently “the business-related services” industry rapidly lost its employment-absorbing capacity, causing severe nationwide employment problems. 61Under such conditions, it is necessary to construct stronger backward linkages of “the export core manufacturing” industry with proper institutional coordinating mechanisms in the domestic economy. The following policies are imperative in order to establish a stable growth regime. First, we should establish an appropriate mode of régulation and create dynamic industries that can lead the international division of labor in East Asia. Faced with rapid economic growth of China and other Asian countries, the Japanese economy is set to inevitably witness a relative decrease in manufacturing employment. In this situation, it is important to continuously invest in the creation of industries with competitive edge. 62Second, with regard to the service industry, there should be a focus on promoting active innovation not only in business-related services, but also in personal services such as medical care, elderly care, and higher education. In these promising areas, it is important to create an integrated innovation system comprising both manufacturing and service components, supported by an increase in incomes and domestic demand. 63Third, in order to promote innovation in these areas, the establishment of appropriate institutions and a régulation mode is indispensable. In the Japanese economy, only large export-goods manufacturing firms have trade surplus, weakening their linkages with other industries, and small and medium-sized firms. Moreover, the Japanese mode of régulation has demonstrated dysfunction. Therefore, in order to realize a new stable growth regime, it is necessary to establish a new form of institutional and structural compatibility among the financial system, wage-labor nexus, and the system of public finance, to enable a new development of medical care, social welfare services, and higher education, with sufficient employment growth. In this regard, social compromise encompassing both regular and non-regular workers should be established to introduce effective programs for skill formation, employment security, wage determination, and social welfare. Amable B., Barré R. and Boyer R. (1997), Les systèmes d’innovation : à l’ère de la globalisation, Paris, Economica. Baumol W.A. (1967), “Macroeconomics of Unbalanced Growth: the Anatomy of Urban Crisis”, American Economic Review, vol. 57, n° 3. Bowles S. and Boyer R. (1990), “A Wage­led Employment Regime: Income Distribution, Labour Discipline and Aggregate Demand in Welfare Capitalism,” in The Golden Age of Capitalism: Re­interpreting the Postwar Experience, Marglin and Schor (eds. ), Oxford: Clarendon Press. Boyer R. (1988), “Formalising Growth Regimes,” in Technical Change and Industrial Transformation, Dosi G. et al. (eds. ), London: Pinter Publishers. Boyer R. and Petit P. (1991), “Kaldor’s Growth Theories: Past, Present and Prospects for the Future,” in Nicolas Kaldor and Mainstream Economics: Confrontation or Convergence?, Nell E. and Semmler W. (eds. ), London: Macmillan. Boyer R., Uemura H. and Isogai A. (eds.) (2012), Diversity and Transformations of Asian Capitalisms, London: Routledge. Boyer R. and Yamada T. (eds.) (2000), Japanese Capitalism in Crisis: A regulationist interpretation, London: Routledge. Franke R. and Kalmbach P. (2003), “Structural Change in the Manufacturing Sector and itsImpact on Business-Related services: an Input-Output Study for Germany”, IKSF, Discussion paper n° 29, University of Bremen. Franke R. and Kalmbach P. (2005), “Structural Change in the Manufacturing Sector and its Impact on Business-Related Services: an Input-Output Study for Germany”, Structural Change and Economic Dynamics, vol. 16, Issue 4, p. 467-488. Fukao K. (ed.) (2009), The Macro Economy and Industrial Structures, Keio University Press. Fukao K. and Miyagawa T. (eds.) (2003), “Industrial Productivity and Economic Growth: 1970-1998”，Economic and Social Research Institute, Cabinet Office, Economic Analysis, n° 170. Fukao K. and Miyagawa T. (eds.) (2008), Productivity and Economic Growth in Japan: An Industry-Firm Level Empirical Analysis with JIP Database, Tokyo: University of Tokyo Press. Harada Y. (1997), “A Study of Theoretical Model of De-industrialization: Focusing on Uneven Development and Cumulative Causation”, Economic Science, vol. 45, n° 3. Harada Y. (2007), “Varieties of Industrial Structural Change: An Attempt of Typology Based on a Multivariate Analysis”, in A New Aspect of Contemporary Capitalism, Yamada T., Uni H. and Nabashima N. (eds. ), Showado. Kaldor N. (1978), Further Essays on Economic Theory, London, Gerald Duckworth. Landesmann M. A. and Scazzieri R. (eds.) (1996), Production and Economic Dynamics, Cambridge: Cambridge University Press. Marglin S. (1984), Growth Distribution and Prices, Harvard University Press. Marglin S. and Schor J. (eds.) (1990), The Golden Age of Capitalism: Re­interpreting the Postwar Experience, Oxford: Clarendon Press. Pasinetti L.L. (1981), Structural Change and Economic Growth: A Theoretical Essay on the Dynamics of the Wealth of Nations, Cambridge: Cambridge University Press. Petit P. (1986), Slow Growth and the Service Economy, London: Frances Printer. Petit P. (1988), La Croissance Tertiaire, Paris, Economica. Petit P. (2005), Croissance et richesse des nations, Paris, La Découverte. Rowthorn R. (1982), “Demand, Real Wages and Economic Growth”, Studi Economici, n° 18. Rowthorn R. (2013), “The impact of China and India on the advanced economies”, in Industrialization of China and India: Their Impacts on the World Economy, Yokokawa N., Ghosh J. and Rowthron R. (eds. ), Routledge. Rowthorn R. and Ramaswamy R. (1999), “Growth, Trade, and Deindustrialization,” IMF Staff Papers, vol. 46, n° 1. Rowthorn R. and Wells J. (1987), Deindustrialization and Foreign Trade, Cambridge: Cambridge University Press. Tahara S. (2009), “Mutual Linkages between the Manufacturing Industry and the Service Industry: An Input-Output Analysis of the Japanese Economy 1980-2000”, Yokohama Journal Social Sciences, vol. 14, n° 3. Tahara S. (2010), “Structural Changes in the Manufacturing Industry and their Impact on Sectoral Output and Employment,” Yokohama Journal Social Sciences, vol. 15, n° 3. Tahara S. (2011), “Structural Changes in the Manufacturing Industry and the Expanding Service Economy: An Input-Output Analysis of the Japanese Economy”, Ph.D Thesis, Yokohama National University. Taylor L. (1991), Income Distribution, Inflation, and Growth: Lectures on Structuralist Macroeconomic Theory, Cambridge, MA: MIT Press. Uemura H. (1991), “De-industrialization and Structural Changes in Capital Accumulation”, Keizai Hyoron, vol. 40, n° 11. Uemura H. (2000), “Growth, distribution, and structural change in the post-war Japanese economy,” in Japanese Capitalism in Crisis: A regulationist interpretation, Boyer and Yamada (eds. ), London: Routledge. Uemura H. (2012), “Institutional changes and the transformation of the growth regime in the Japanese economy: Facing the impact of the world economic crisis and Asian integration,” in Diversity and Transformations of Asian Capitalisms, Boyer, Uemura, and Isogai (eds. ), London: Routledge. Uni H. (1998), Structural Change and Capital Accumulation, Yuhikaku. Uni H. (2007), “Structural Change and Capital Accumulation in Japan and the US in the 1990s”, in A New Aspect of Cotemporary Capitalism, Yamada T, Uni H. and Nabashima N. (eds. ), Showado. Uni H., Yamada T., Isogai A. and Uemura H (2011), The Régulation Theory of Financial Crisis: Agendas of the Japanese Economy, Showado. Wang J., Shrestha N. and Uemura H. (2012), “Chinese international production linkages and Japanese multinationals: Evolving industrial interdependence and coordination,” in Diversity and Transformations of Asian Capitalisms, Boyer, Uemura, and Isogai (eds. ), London: Routledge. 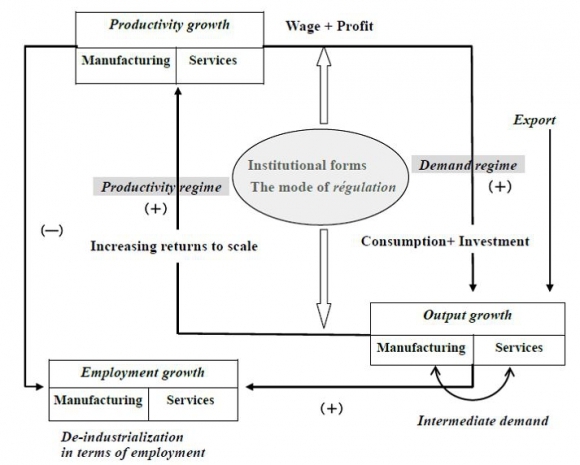 2 In Japan, “de-industrialization” has been studied within the framework of the regulation theory. For example, see Uemura (1991), Harada (1997, 2007), and Tahara (2009, 2010, 2011). 3 H. Uni analyzed both cumulative growth and structural change by developing the macroeconomic analysis of the regulation theory based on an Input-Output Analysis (Uni, 1998). 4 In the régulation theory, there are five institutional forms: the form of competition, wage-labor nexus, monetary/credit regime, the state/economy nexus, and insertion into the international economy. 5 Growth patterns differ from country to country, depending on specific institutional arrangements. In the case of Japan, “profit-led growth” played a leading role in the high economic growth of the 1960s, and “export-led growth” became dominant after the 1980s (Uemura, 2000, 2012). 6 When we look at the export goods manufacturing industry which was faced by the appreciation of yen, the fall in the profit rate was much clearer. 7 For the analysis of the potential output-capital ratio and capacity utilization, see Uemura (2000, 2012). There is a decreasing trend of output-capital ratio in the Japanese economy. 8 Uemura (2000) analyzes thoroughly the “counter-cyclical” movement of wage share, taking account of institutional arrangements in the “wage-labor nexus” in the Japanese economy. 9 Certain industries which are classified under “export core manufacturing,” namely, “transportation equipment,” “general machinery,” “electronic and electrical equipment,” and “precision machinery and equipment” have higher export-output ratios between the period 1980 and 2008. 10 The “Japanese Big Bang” was brought about by neo-liberalist policies in the late 1990s. The influence of the Asian finical crisis was relatively weak in Japan. 11 The ratio of overseas production did not increase in the electronic and communication machinery industry because Japanese firms still tried to keep their domestic production of parts and components within Japan. 12 We should take into account the “subsystem dynamics” (Landesmann and Scazzieri, 1996) of the manufacturing industry itself and manufacturing-service linkadges in the study of de-industrialization in Germany and Japan as well as other advanced countries. 13 Rowthorn and Wells (1987) used “positive de-industrialization” and “negative de-industrialization” to describe structural change in the economy as a whole, but we use these terms to explain the pattern of structural change at the industrial level.